Police say a man with a gun stole money, ice cream from a Hillsboro Plaid Pantry on New Year's Eve. The Hillsboro Police Department is asking for the public's help identifying a robbery suspect who robbed a local convenience store on New Year's Eve. 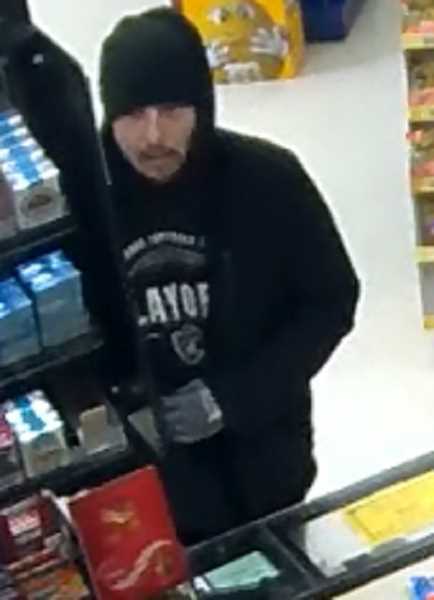 On Tuesday, Hillsboro Police released a photo of a man believed to have robbed the Plaid Pantry convenience store at 101 N.E. 43rd Ave., near the intersection of Brookwood Avenue and Main Street. According to Hillsboro Police Lt. Henry Reimann, the suspect entered the store at about 10:19 p.m., carrying a black handgun. The man pointed the weapon at an employee and demanded money from the register. The suspect took an undisclosed amount of cash and ran off, Reimann said. He also stole a pack of Marlboro Red cigarettes and two ice cream bars, according to police. The suspect is described as a white man, about 5-feet-5-inches tall, wearing a black jacket, an Oakland Raiders shirt and a black hat. Anyone with information regarding this case is asked to call 503-681-6261.